He was born on 18.11.1952 in Shahdadpur Town of District Sanghar,Sindh. He received education from primary to graduation at Shahdadpur and got degree of B.A. in 1973 from University of Sindh, Jamshoro, in 1976 he passed LLB. Examination from Sindh Law College, Hyderabad and obtained degree of law graduate from Sindh University. During his student life, he also participated in various social and literary activities. He joined legal profession and started practice as an Advocate at Shahdadpur for which he was enrolled by Sindh Bar Council on 11.05.1978 and then he was enrolled as an Advocate of High Court of Sindh on 29.07.1982. Thereafter he joined judicial service on 31.10.1982 as Civil Judge in BPS-17 and after his promotion as Senior Civil Judge and then Additional District & Sessions Judge, he was promoted as District & Sessions Judge in September 2000. During service he received In-service Training at Sindh Judicial Academy, Karachi and joined the Courses at Shariah Academy of International Islamic University, Islamabad during which a study tour was also undertaken when he visited Sudan, Jordon and Saudi Arabia. He also attended various seminars and conferences, including International Judicial Conference. He remained Member, Board of Governors, Sindh Judicial Academy, Karachi and also the Member of the Rule Committee of Sindh High Court during his posting as District & Sessions Judge. In September 2009 he was posted as Registrar (BPS-22) of Sindh High Court at Karachi and on 18.02.2010 he was elevated to the Bench. His numerous decisions/judgments, authored by him, are reported in various journals of the country. 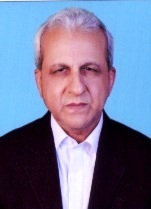 After rendering about 32 years of judicial service, including the period he remained as Judge of Sindh High Court, he is now retiring on 17.11.2014 from Judgeship on attaining the age of superannuation.